Pep Guardiola spoke of his pride as Manchester City moved back to the top of the Premier League table following a 2-0 victory over Everton. City had fallen seven points behind Liverpool last month but have reeled their title rivals back in, and goals from Aymeric Laporte and Gabriel Jesus wiped out that deficit on Wednesday. Defending champions City are now back at the summit on goal difference, although they have played a game more than Liverpool. 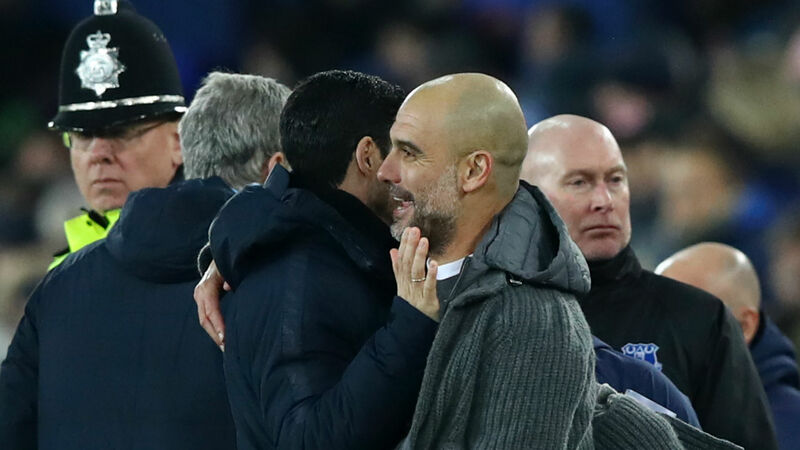 Guardiola was delighted to have come away from Goodison Park with all three points midweek, and praised his squad's hunger to get themselves back into the title race. "It's much better [being top]," he told a media conference. "We have played one more game. It's the best we can do. "The reality is we could have been one month ago 10 points behind when we played Liverpool. A few days ago we could have been seven points behind. Now we are top of the league. "That is the best advice, the lesson is – never give up. That is a lesson for all athletes. Try to win the games, because life can change immediately. "I don't know what the opponent thinks. There are a lot of contenders to fight for the title. Of course. The rivals are there. There are a lot of games. Every game is tough. We knew this would be tough. FULL-TIME | YESSSSS! We dig in deep for three precious points! "The amount of games we have in our legs, we cannot give days off. We come from 100 points, we come from champions and we are in a situation where we could have given up but it didn't happen. "We gave an incredible game against Liverpool. These players have shown incredible desire and performances for the last two years. How could I question them?" City were far from their fluent best on Wednesday but had enough quality to overcome an Everton side that have caused them problems in the past. "Always the application is there," he added. "The performance is not as good as we expect. "Goodison Park is always difficult for Man City in the last decade. We play a tough game three years ago here. "We made a good first half. We didn't concede one shot on target here which is not normal. We have another big test [against Chelsea on Sunday]. "Chelsea are an exceptional team who have had seven days to prepare. We have to prepare well. It really is final for us this weekend. If we are able to take these points, it is a huge step forward."